Are you 21 or over and a smoker? Check this deal out! 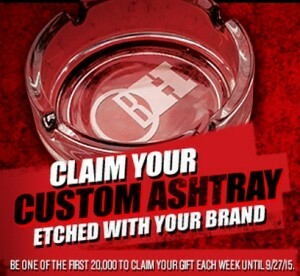 If you are one of the first 20,000 people to respond, each Monday starting at 6AM EST, you’ll be able to get a FREE Custom Ashtray from Marlboro!! You only need to click here and register with a short form. You’ll want to enter quickly as the deal is limited by supplies and will end on September 28, 2015!